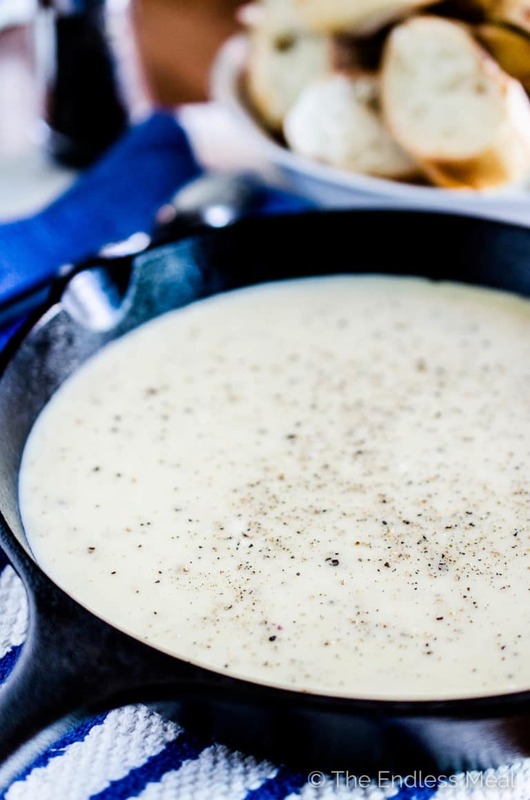 Caramelized Shallot and Gruyere Cheese Fondue is the best cheese fondue you will ever eat! It actually felt a little sacrilegious when I started serving this caramelized shallot and gruyere cheese fondue at the supper club. I felt like there was something wrong with eating fondue outside of Christmastime … until I had my first bite. Any notion of it being sacrilegious went out the door and became a big pile of cheesy, gooey deliciousness. Of the few fondues I've made, this is my favorite. By far. And from all the moans coming from around the dinner table as people gorge on melted cheese covered bites of sourdough, I'm not the only one who loves this. But then what's not to love? Gruyere, check. Melted cheese, check. Melted cheese … oh wait I said that one already, right. I know that making fondue can be a bit intimidating. If you've made it before you might have even had it go a bit lumpy, right? I bet it still tasted amazing, but who wants lumpy melted cheese? 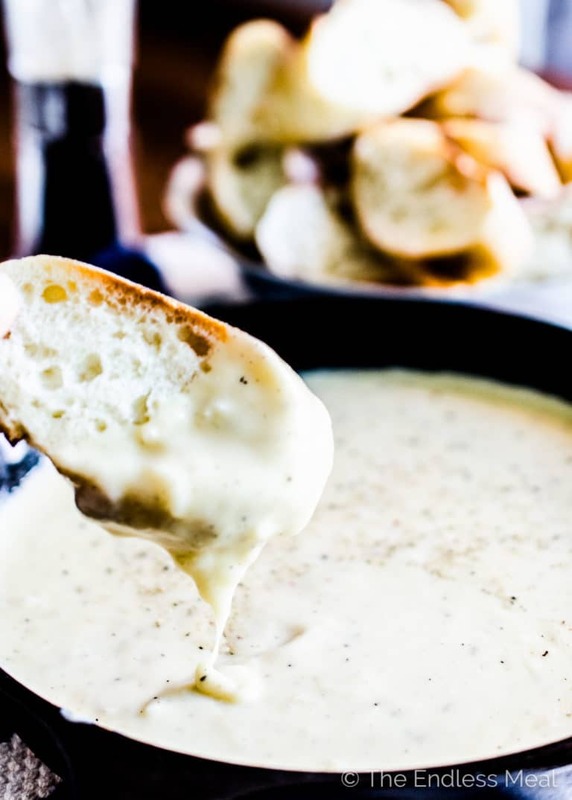 But don't worry, with just a few simple tricks you can have fail-proof smooth, perfectly melted and delicious fondue. Want to know what those tricks are? Always (always always) start with your cheese finely grated. It does take a bit more work but when I've been in a hurry and grated it using the regular larger holes it separates and becomes lumpy. I'm not sure why but grating it using the smaller holes always works. Add only a small handful of cheese at a time and make sure that the cheese has completely melted and the pot returns to a boil before you add any more. Again, I'm not sure why but this does work. Every time. That's it. I make this dish regularly and as long as I follow those two rules it always turns out perfect. 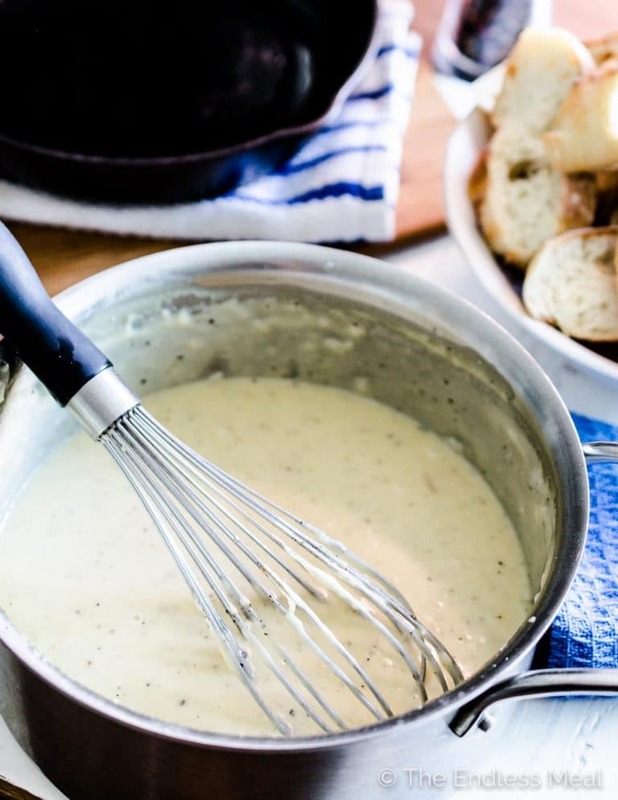 If you make this Caramelized Shallot and Gruyere Cheese Fondue make sure to snap a pic and tag @theendlessmeal on Instagram so I can like and comment on your photos. I love seeing TEM recipes you create. 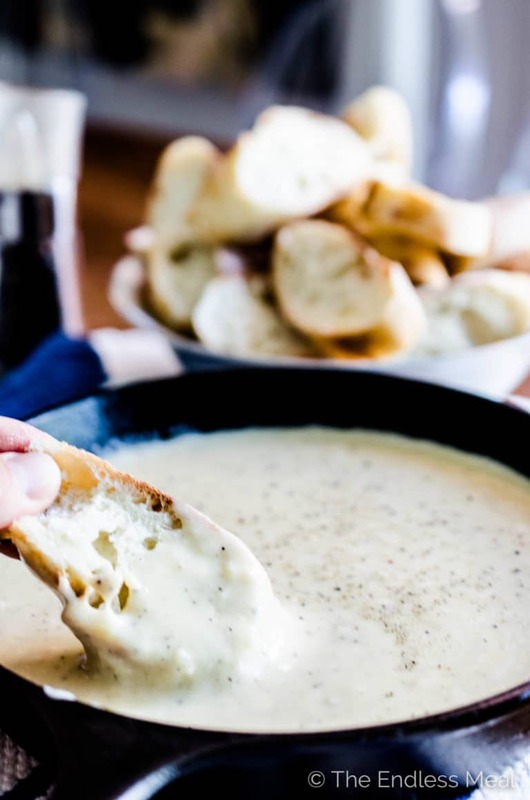 The Caramelized Shallot and Gruyere Cheese Fondue is the perfect appetizer when its served with sourdough bread, vegetables, or even spicy sausage. 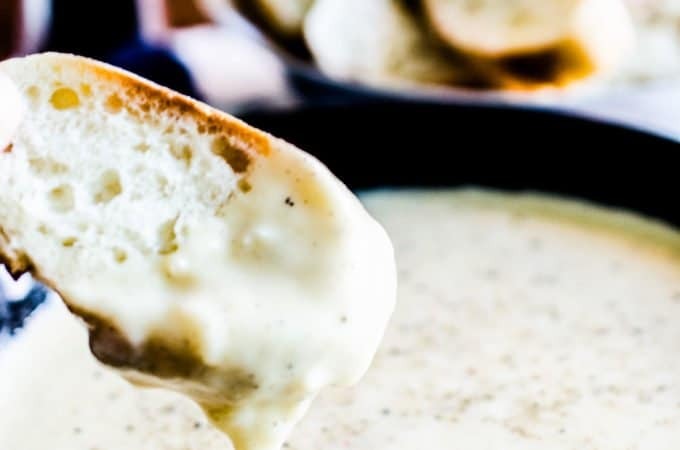 While bread is what is often served with fondue, there are many other things that you can use to dip that I actually prefer. Some of my favourites are: spicy sausage, sautéed whole mushrooms, lightly steamed broccoli and cauliflower, prawns, tiny roasted potatoes and slices of apples. Melt butter over medium heat in a medium sized, heavy bottomed saucepan. Add shallots and cook for 2 minutes. Add sugar and salt and cook, stirring occasionally for about 15 minutes. While the shallots are caramelizing, grate the cheese using the fine edge of the grater. Add to a large bowl and toss with the flour, or for a gluten free fondue toss with corn starch. Add the white wine to the shallots and bring to a boil for 1 minute. One small handful at a time slowly begin to add the cheese. Whisk until the cheese is melted and the pot returns to a boil before adding more. Continue until all the cheese has been added into the fondue. Whisk in the nutmeg, garlic, calvados and pepper. Be generous with the amount of pepper you grind in. Check for seasonings and add more salt and pepper as necessary. If you would like your fondue to be a little thinner you can add another splash of wine or even water. Use a dry white wine such as a pinot gris or a sauvignon blanc in this recipe. The fondue can be made up to a day in advance. Store the cooled fondue in your fridge until about 15 minutes before you would like to serve it. Warm it on medium low heat and whisk frequently until it is hot and bubbling. You may need to add a splash of water to thin it a little. I made this for New Year’s and it was perfect! Wonderful flavors. If I don’t ever buy wine, even for cooking is there anything you’d recommend to substitute? I’d love to try this for Valentine’s Day! Thanks! You could definitely sub beer or ale, just make sure that it is not hoppy as that would throw the taste off. A dry cider would probably be best. Although you could sub something non-alcoholic you might end up with a fondue that breaks. The acidity in the wine helps to bind the cheese so it doesn’t end up lumpy. Remember that the alcohol in the wine does burn off when you boil it at the beginning so it is perfectly safe to serve to kids or someone who doesn’t drink alcohol. This recipe is to die for. I made it last night for friends exactly by the recipe and it turned out better than I ever imagined it would. It was the star of the show. Kristen! I have really been enjoying exploring your blog. Such beautiful photos and unique recipes!! This looks particularly delicious. I might just have to give it a try this week!